Remove engine under cover. Refer toEXT-37, "ENGINE UNDER COVER : Removal and Installation". Remove drive belt. Refer to EM-13, "Removal and Installation". 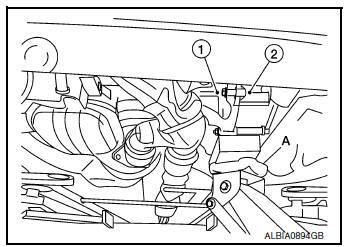 Remove the engine mounting bracket (LH). Refer to EM-81, "Exploded View"
Disconnect harness connector from intake valve timing control solenoid valve. Refer to EM-44, "Exploded View"
Disconnect harness connector from intermediate valve timing control solenoid valve. Refer to EM-44, "Exploded View"
Disconnect harness connector from exhaust valve timing control solenoid valve. Refer to EM-44, "Exploded View"
Disconnect harness connector from camshaft position sensors. Refer to EM-64, "Exploded View"
Remove the spark plugs. Refer to EM-17, "Removal and Installation". Loosen the bolts in the numerical order as shown using power tool. Remove the rocker cover and the rocker cover gasket. Discard the rocker cover gasket. CAUTION: Do not reuse the rocker cover gasket. Remove the oil filler cap, (if necessary). 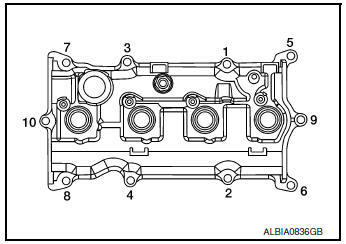 Apply liquid gasket to joint part of No.1 camshaft bracket (1) and cylinder head. Apply liquid gasket in a 90° degree angle (B). Install rocker cover gasket to rocker cover. 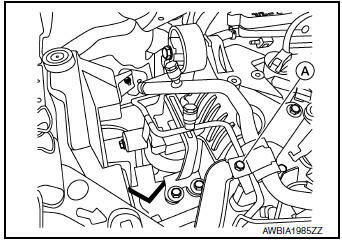 NOTE: The rocker cover gasket must be securely installed in the groove in the rocker cover. 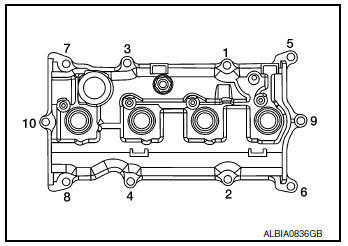 Install the rocker cover and rocker cover gasket onto the cylinder head. 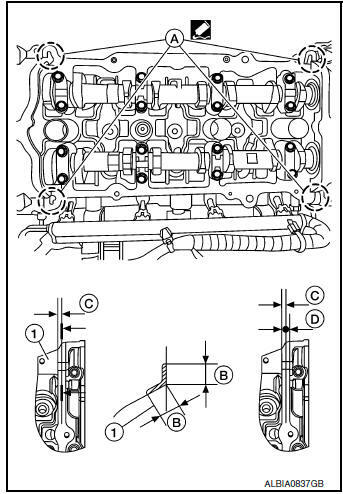 Tighten the rocker cover bolts to specification in two steps in the order shown. Inspect for engine oil leaks. Refer to LU-7, "Inspection".